Without going too much into the book and telling you everything that happens, I will say this – you will be taken on an emotional and physical journey with Francis through what really adds up to a very short but intense time period in his life. Don’t let that frighten you – the novel is an easy yet intellectual read, giving readers insights into their own personal journeys while they follow Francis along his. For that is what Kevin Craig excels at – giving us stories about people which make us directly look at our own lives, and what we could do to make our own worlds better for ourselves and the people around us. I was lucky enough to catch Kevin for an interview, where I asked him about Burn Baby Burn Baby, about his writing in general, and, most importantly, about the place that provides him with his writer’s ambrosia, Starbucks. 1. What does your favourite latte say about you as a writer? Haha! Interesting lead question. You're just trying to source the best latte. I can see right through you. I'm not sure what it says about me, other than I'm a unique special flower. I have my own drink at Starbucks. It's kind of my trademark...my signature drink, if you will. When I go to Starbucks, I order a grande Raspberry Vanilla Latte. 2 and 2 pumps. With an extra shot. It's delicious. And the foam has a pink swirl in it. Because I'm a unique special flower. Nah. Not really. What it probably says about me as a writer is that I'm spending too much time at the counter making up pretentious drink concoctions in order to avoid the inevitable bum-in-chair time needed to hone my craft. 2. You wrote your first draft of Burn Baby Burn Baby at the Muskoka Novel Marathon 2012, and gave a detailed encounter on your blog about the mindframe you returned to in order to immerse yourself to be able to write your character. You yourself have been through some personal struggles and conquests since your first draft. Did any of your own recent experiences of triumph and liberation add to the emotions you put through in your subsequent drafts, in particular, to emphasize Francis’s feelings when he allows himself to be loved by Rachel along with his other victories in the story? My first draft is almost the same as my final draft. All the time. I fiddle with words here and there, but when I write a novel it's the novel I want to appear on the bookshelf. 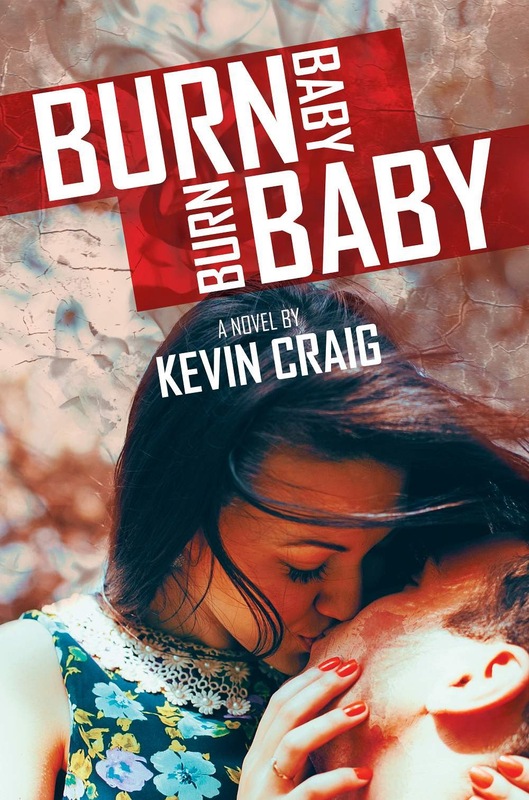 The first draft of Burn Baby looked almost identical to the draft found inside that beautiful cover. 3. Recent stories in the media have brought domestic abuse, and abuse in general, back into the spotlight in Canada in particular. Personally, I feel stories like yours are necessary, especially for young people who may find themselves in this situation, as you note in your dedication. Once again, you discussed on your blog that you were a survivor of abuse and bullying. If someone who read your novel is in a situation where they are being bullied and/or abused and they reached out to you for help, what kind of advice would you give to them? I'm not a professional. I'm not qualified to give such people any advice. I would plead for them to seek help through the proper channels. I would stress IT'S NOT YOUR FAULT. I would tell them they are not alone. I would tell them to SPEAK. Speaking our truth takes the power from those who would hurt us. Speaking is taking steps away from the abuse and/or bullying. Speaking is power. 4. You led us in a writing exercise recently where you had us put our characters from our recent pieces into situations that were not in our story so that we could think of them and their reactions from outside of the confines of the story we put them in. So I'm going to ask - what do you think would happen to Francis if he and Rachel broke up? Do you think he would be able to find a new love because he was able to find his first love? That's a beautiful question and I think you broke my heart just a little bit just now. I will reluctantly answer your question. Francis was always a strong character who didn't know his own inner strength. Rachel entering his life allowed him to shine a light into his heart. Relationships are a beautiful thing in the way they allow us to reflect our own light back onto ourselves. Loving and being loved by Rachel gave Francis a little freedom from the dungeon of his own thoughts of unworthiness and self-doubt. Love allowed him to see that he was worthy of love. It's a simple equation, really. Love equals love. If he leaves that relationship, he will know in his heart that it could and would happen again. He would make it. And he would find love again. 5. You are a writing machine - you have another new novel coming out in about a month, Half Dead & Fully Broken, which is the story of a brother managing after the death of his twin brother. In Burn Baby Burn Baby, Francis has twin half-brothers. In Sebastian's Poet, we find out that the Poet himself is a twin. So why all the twins? WOW! I had no idea. You just totally freaked me out. How did I miss that?! I guess, in all honesty, I've always been fascinated by the twin thing. But I didn't realize it had penetrated my writing so deeply. There's a crazy amount of twins in my family. My grandmother had twins. One of those twins had two sets of twins. On the other side I have two sets of identical twin cousins. They're everywhere! 6. Finally - what does your favourite Starbucks cookie choice say about you as an author? I get to talk about my Mecca twice in the same interview! This is awesome. MY Starbucks cookie is the Ginger Molasses Cookie. Molasses is my comfort food. It kind of IS my spirit animal. Molasses takes me back to New Brunswick, where my grandparents were, where my uncles and aunts and cousins are. Molasses cookies, molasses bread, molasses cake, molasses and old cheddar sandwiches! Those sandwiches were the best. I didn't realize they were weird until I started mentioning them around non-New Brunswickers. When I bite into a Starbucks ginger molasses cookie, for just a split second I'm back in my Nana's kitchen. She's standing over by the old woodstove frying up potatoes and onions in her big cast iron frying pan, and Olivia Newton-John's Let Me Be There is playing on the turntable. And we're both singing along. And laughing. What my Starbucks cookie says about me is that I'm a nostalgian. If that wasn't a word before today, it is now. Forgive my presumptuousness. But I'm a writer. I work with words. When I can't find the one I'm looking for to encompass what I'm trying to say...well, I'm allowed to make one up. My Starbucks cookie says that I'm a sap, I love nostalgia, I love giving my readers little nuggets that might toss them back into their own memories. I'm all about poignant moments. And the ginger molasses cookie clearly represents these things. Burn Baby Burn Baby is available now in ebook and book book form at your favourite ebookstore: Amazon, Barnes & Noble, and Kobo. Follow Kevin’s adventures at Starbucks and other places that don’t serve coffee on Instagram, Facebook, Twitter, Goodreads and his blog.